Before the war little had changed in farming practices for more than a hundred years and most jobs were done manually using horse power. The impetus to mechanise farming activities really only started at the time of the Second World War. At that time the government was obliged to see that the land produced enough food for the British population as imports from overseas could no longer be relied on. Some of the young Paglesham men who had worked the land from their earliest youth signed up to fight for king and country. Many, like Jim Thorogood, whose occupations were reserved stayed in Paglesham. Those who stayed formed the local Home Guard. Later in the war they found themselves supervising young German prisoners of war who were conscripted as farm labourers. The main crops then, as now, were hay, wheat and barley. Each field would have been much smaller and often surrounded by a hedge and ditch. Church farm was gifted to the Ministry of Agriculture, Fisheries and Food by a Mr Martin and run by a paid manager. The farm was not sold back into private ownership until the 1970s when it was sold by auction. The owner of Lunt's farm had a horticultural business and grew vegetables. A flock of sheep was kept at East Hall farm and cows were kept at South Hall (also known as Perry's farm). 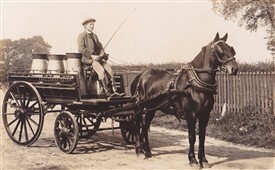 The cows were milked by hand and the cooled milk would be stored in metal churns until they were loaded onto the horse drawn cart to be taken round the village. Housewives would come out of their cottages with their jugs and the rich, creamy, unpasturised milk was ladled out of the churns by the roundsman. 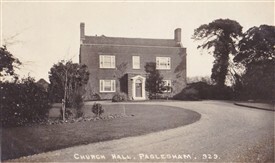 There were no refrigerators in Paglesham cottages then but the milk would be kept as cool as possible in the pantry and only enough would be bought to be used straight away. Even so, milk often turned sour and then would be used to make curd cheese. Many years later, Peter Thorogood discovered a rotting milk cart under masses of brambles in a barn which was about to be demolished. The land was cultivated by a man walking behind a plough or a harrow, drawn usually by two horses. Then it was seeded with a horse drawn seed drill and hoed, sometimes by hand, to keep down the weeds when the seeds came through. 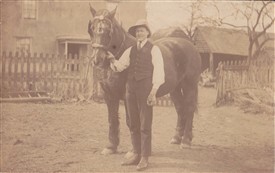 Jim Thorogood, Peter's father, was one of the horsemen. Hay was the first crop of the year and would be cut and turned with horse drawn implements. The dry hay would then be forked onto carts to be taken to the farmyard and made into stacks. Harvest time was the busiest time of the year and everyone lent a hand. 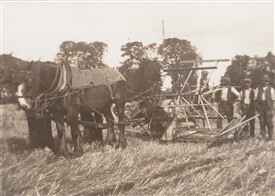 Again, horses were the source of power although the cutting and tying of sheaves of corn was now sometimes mechanised. Corn grew to a yard or so in height as the straw was used as bedding for farm animals and for thatching. School summer holidays could start any time from the end of June until the beginning of August as the children, too, were given things to do at harvest so the holidays began when the corn was ripe, which depended on the weather. One job usually done by women and children was to collect the sheaves thrown out behind the reaper and stack them in rows to dry. Each stack was known as a 'stook' and usually consisted of about six sheaves. They made great camps for the children to play in once the work was done. 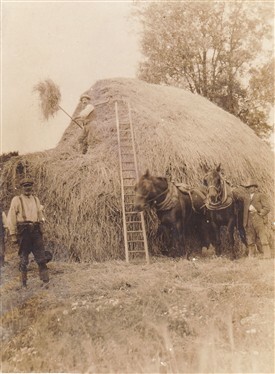 The harvested corn was loaded, as high as possible, onto carts and taken to the stack yard where it was unloaded and built into stacks which would be thatched later to keep rain out. The corn would be threshed in winter in a barn with its doors on opposite sides left open so the wind could blow away the chaff. The clean grain would then be shovelled into sacks for storage. By the end of the war, in 1945, the improvement in machinery and increased land brought into cultivation by clearing hedges and improving drainage, meant that farm output had increased by 80% over prewar production. The long hours and hard work done by farmworkers such as those at Paglesham, and indeed the whole Rochford Hundred, played an important part in this success. (Thanks to Peter Thorogood for permission to use photographs from his collection and for sharing memories with us). This page was added by Sue Horncastle on 20/05/2013.